For the Fairest complexions, the Ben Nye Make-Up Kit contains all the necessary make-up for your typical stage production. Include base, highlight, shadow, blush, lip color, eye pencil, brush, powder, stipple sponge, sponge, and puff. Usable for several production. plus shipping and handling within domestic. For darker complexions. This kit contains a dark tone base, highlight, shadow, lip color, blush, eye liner, brush, applicator sponge, stipple sponge, power and puff. For the darker Olive complexion. This kit contains a generous supply of each of the following maekup components selected for this skin tone: Creme Foundation, Highlight, blush, shadow, lip color, face powder,and puff, eye pencil, brush, sponge application and stipple sponge. Price includes shipping and handling within the domestic US. For the darker Black complexion. This kit contains a generous supply of each of the following maekup components selected for this skin tone: Creme Foundation, Highlight, blush, shadow, lip color, face powder,and puff, eye pencil, brush, sponge application and stipple sponge. Price includes shipping and handling within the domestic US. One of the most popular Halloween products, this kit includes Vampira Foundation, Four Color Vampire Palette, Black Pencil, Stage Blood, Fangs, Flat Brush, Songe Applicators, and directions. Minimum of 4 - 6 applications per kit. Price includes shipping and handling within the domestic US. 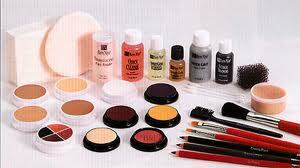 This is the kit that is standard to most caucasion complexions. Dense pigment in the base color stand up to the brightness of the theatre lights. Kit includes base, highlight, shadow, blush, lip color, eye pencil, brush, sponge applicator, stipple sponge, powder and puff. Cost include $18.00 list price plus shipping and handling within the domestic US. For the fair Olive complexion. This kit contains a generous supply of each of the following maekup components selected for this skin tone: Creme Foundation, Highlight, blush, shadow, lip color, face powder,and puff, eye pencil, brush, sponge application and stipple sponge. Price include shipping and handling within domestic US. For the lighter Black complexion. This kit contains a generous supply of each of the following maekup components selected for this skin tone: Creme Foundation, Highlight, blush, shadow, lip color, face powder,and puff, eye pencil, brush, sponge application and stipple sponge. Price includes shipping and handling within the domestic US. Special cream colors and clasic aging techniques produce theatrical and masquerade success. 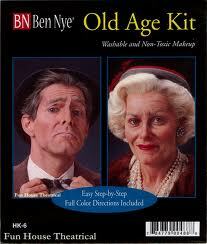 Detailed directions are included in the kit for both male and female aging. The kit includes old age foundation, four color old age palet, dark brown pencil flat brush, silver grey hair color, sponge applicator, stipple sponge. Minimum of 4 - 6 applications per kit. Price includes shipping and handling within the domestic US. Create durable and realistic lacerations, burns, wounds, and scars with this useful pack of gels. Wounds may be pre-made. Detailed instructions are included. Expect 30 applications per kit. Price includes shipping and handling within the domestic US.